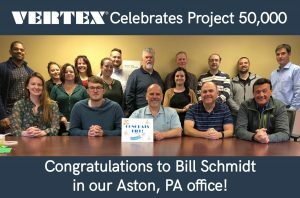 VERTEX’s Project 50,000 was initiated earlier this month by our Phili-metro office. Congratulations to our PA team on opening the monumental Project Number! This project milestone represents a level of experience and achievement that few in the AEC industry can claim. This photo shows some of our PA team and was taken at lunch hour during their celebration of opening the monumental Project Number. Pictured from left: Rafhael Gandolff, Lauren Beyrent, Dani Reed, Christina Putman, Melissa Gardner, Erik Eichenlaub, Jen Christensen, Nat Geary, Dave Turotsy, Bill Schmidt, Jessica Fox, Jeff Forester, Eric Nelson, BJ Brunner, Dave Galajda, Don Heim, Bill Otten. Thank you to all the employees for their contributions over the years. Here’s to the next 50,000 projects! To learn more about VERTEX’s Services, call 888.298.5162 or submit an inquiry.